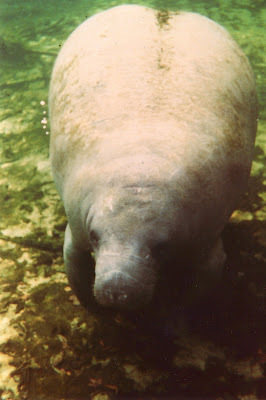 Jad discovered manatees a month or so ago, while watching an episode of the "Reading Rainbow". Ever since, he's been very concerned about the fate of these large, slow moving marine mammals. One of the biggest threats to this endangered species is injury from propellers on motorboats cruising the waterways of Florida. The other day... in the middle of his normal activities (figuring out if he could fit a manatee in the bathtub, conducting science experiments, saving the world, building "inventions" and "reading" Tintin and Asterix and Obelix books), he decided it was time to pray about the situation. "Dear God" he started. "Please help all the people in Florida to drive rowboats. Amen." Talk about a specific, logical prayer request! If all the people in Florida rowed rowboats, the number of propeller injuries to Manatees would certainly decrease dramatically. Of course, whacks on the head by an oar may become more prevalent, but oars are seldom lethal. So - if any of you out there are reading this from Florida... for Flash's sake... please consider trading in your Boston Whaler for a nice, reliable rowboat. Just think of the money you'd save on gas alone!